The sad thing about historical biographies is that the hero always dies at the end. Just imagine: you follow the life of, in this case, Elizabeth I for seven hundred pages only to see her age and die. A book with a claim for scholarly accuracy hardly can go any other way. I almost felt sad. 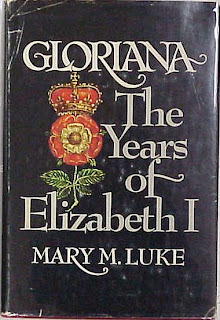 Just as well that the author, Mary M. Luke, chose not to dwell on the final years of the great monarch. None of Elizabeth's biographies that I've read (quite a few by now) treated the subject with any more deliberation. Perhaps there isn't really that much to tell - the Queen is dead, long live the King. Maybe, though, various biographers become mildly attached to their heroine too and want to get through the unpleasant necessity as speedily as possible. Or am I being sentimental? Compared to other books about Elizabeth Tudor, Gloriana: The Years of Elizabeth I holds its ground very well. It's a massive tome but Mary M. Luke managed to keep a reader captivated all the way through. The main events and influences in the queen's reign are beautifully balanced, weaved together into a dynamic narrative that reads almost like a novel. Almost, but not quite; it is a history book after all. The writer's creativity may have coloured some events for effect, some of the queen's reactions might be imagined rather than reported, but overall the book sticks to verifiable facts. Original documents are often quoted to strengthen debatable statements and if some conjecture is inevitable, it is subtle enough not to irritate. Gloriana begins with queen's death (Mary's) and ends with queen's death. For early years of Elizabeth it is best to turn somewhere else, because this particular book offers only glimpses of her years as a princess. How about A Crown For Elizabeth by the same author, book two in the trilogy in which Gloriana is the final instalment? I have not read it, nor the book one, but if I ever come across either, I won't hesitate. Mary M. Luke had impressive skill in bringing Tudors to life, so I bet that her account of Elizabeth's twisting path to the throne is just as unputdownable as the story of her reign.